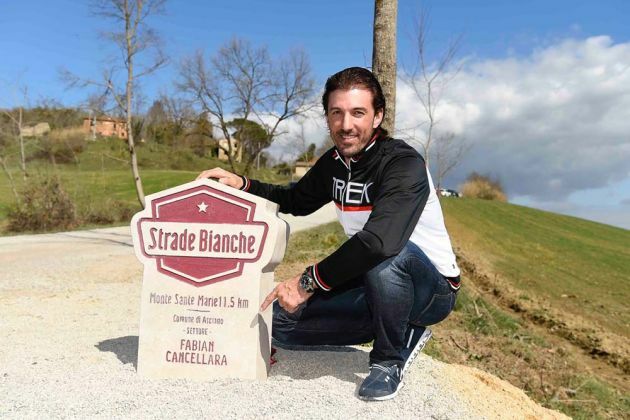 In honour of Swiss cycling star, Fabian Cancellara, a section of white roads were named after him as he marks his three victories so far in the Strade Bianche. Before the beginning of the 2016 edition of the race, RCS Sport the organizers of the race stated that whereby a third edition of the race is claimed by Cancellara, they would name a sector of the iconic white gravel roads used in the race after the Swiss star. Now the organizers of the race have come good on their promise as they permanently commemorate his three wins. His previous victories in the Strade Bianche had been in the years 2008 and 2012 and he added a third win in 2016. This outing became his final as he retired at the end of the season. The eve of the 2017 race, on Friday saw the permanent milestone dedicated to the star rider being unveiled on the Monte Sante Marie in Asciano. Cancellara who spoke at the unveiling noted that it was an honour and he was pleased as well to be given such recognition. “It’s a great honour and a great pleasure for me to receive this recognition because this is a very important race,” said Cancellara. With his retirement, there is a chance for the name of another rider to be added to the list of winners. Cancellara also stated that he sees the duo of world champion Peter Sagan (Bora-Hansgrohe) and Olympic champion Greg Van Avermaet (BMC) fighting it out for the win. “For tomorrow I pick Sagan and Van Avermaet who have already showed in Belgium that they are very strong but I wouldn’t disregard [Zdenek] Stybar and [Fabio] Felline either – I’ve seen them in good shape at the last races,” he said.